Since my last post on the MASS race at French Creek I finally got to do some endurance racing and begin my campaign in the NUE series. A few weeks ago I started off my NUE season with the all new Syllamo 125k, which now happens to be one of my favorite “100 mile” races. This one comes up a little shorter than usual with mileage, but makes up for itself with some great singletrack! From the start I found myself up front with teammate, Christian Tanguy, and former NUE series winner, Jeff Schalk. The pace didn’t seem terribly fast at first as we cruised through the first half of the race together. I had been riding conservatively due to a shoulder injury that was still bothering me from crashing the previous weekend and was not planning on making any moves on my own at this point in the game. As I followed Jeff through a rocky section of trail I punctured my rear tire and was forced to stop and put a tube in the tire to get back up and running again. This unfortunate situation had me riding the rest of the race alone trying to catch back up to the leaders. In the end my place had not changed as I came in 3rd with Christian taking his second NUE series win and strengthening his lead. 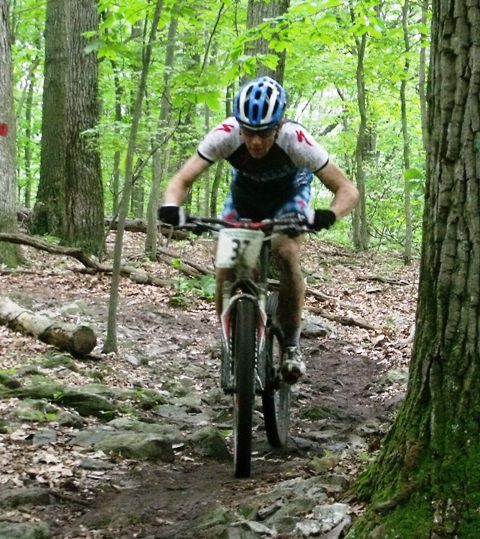 Following Syllamo’s I went back to racing XC at Greenbrier State Park in MD. This race always has a stacked Pro field and this year was no exception with 20 of the area’s top pro racers on the line. The starting pace seemed just as fast as any of the Pro XCT races that I have been doing. Going into the singletrack I found myself somewhere in the top 5 and I tried to pace myself early on so that I could make up time in the later laps. As the race progressed my lap times remained steady and even got faster towards the end. However this was not enough to catch up to race winner, Nick Waite who was only a minute up, or second place finisher, Matt Bailey who had only been 20 seconds ahead. For the second race in a row I took another podium spot finishing up 3rd. This past weekend held another stop in the NUE series with the Mohican 100. After having a breakthrough race here two years ago, finishing 5th in a super competitive field I was ready to top my previous performance. From the start this race had more of an XC feel than an endurance event with Josh Tostado taking the early lead in the singletrack. I followed Josh’s pace and we quickly pulled away from the rest of the field. After the first 15 miles we were alone, but I would soon find out that there was a chase group not too far behind containing Christian, Jeff, and Michael Simonson. By mile 30 where we exited the Mohican Wilderness we were all together for the next long stretch of fireroad and pavement. We rode at a high pace without any more attacks until around mile 50 where Michael laid down a hard effort shattering our group. Josh was the first to drop back followed by me, then Christian, while Jeff hung on and rode away from the rest of us with Michael. From here it would be a long solo stretch until I caught back up to Christian around mile 75. Once bridging back up to my teammate the two of us rode the rest of the race together hoping that the leaders would not be too far ahead. In the end we rolled through the finish together with myself in 3rd and Christian in 4th. In the meantime, teammate Cheryl Sorenson dominated the women’s race taking the win with more than 13 minutes on 2nd place!